The Lightship Portsmouth, built in 1915 and now restored as a museum along the Portsmouth waterfront. It looks like the ship is afloat, but the hull is completely on shore and embedded in concrete. Click on the picture to see a bigger version; use your browser's "back" command to return here. 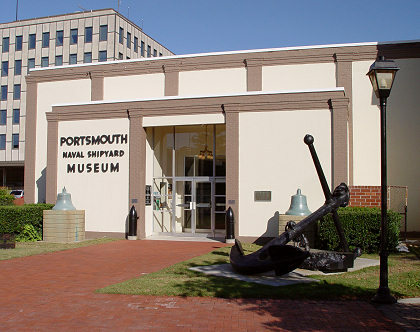 The Portsmouth Naval Shipyard Museum, near the waterfront, has information on the history of the shipyard, which dates back to 1767. The houses of Benthall-Brooks Row, built way back in the 1840s. They are on Crawford Street just south of the marina. 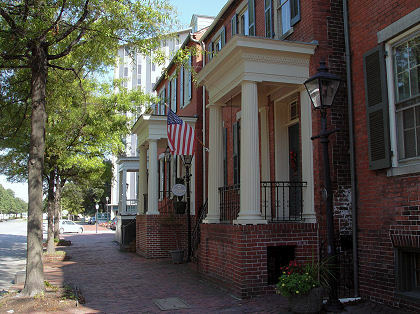 Portsmouth itself is a very old city with a lot of history, going way back to the 1600s. It's had its ups and downs, and in recent years there's been a slow but steady revival, especially along the waterfront and in the Old Towne historic district. 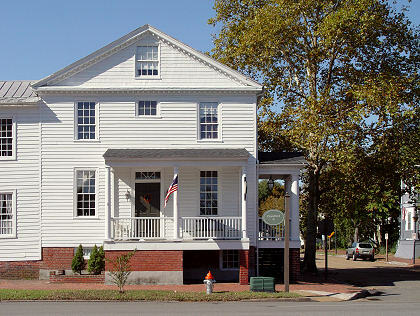 Downtown Portsmouth has a small government and commercial district, with residential and shopping areas to the west (to the east and north is water). Just south of town is the giant Norfolk Naval Shipyard, which is actually in Portsmouth despite its name. 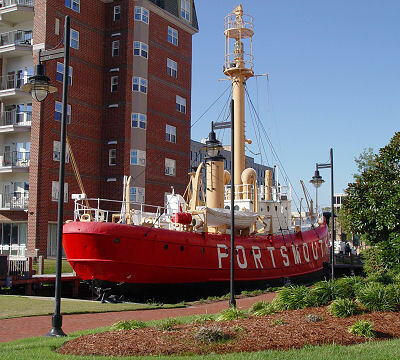 Across the Elizabeth River from Tidewater Marina is the heart of downtown Norfolk, including the popular tourist destinations of Waterside and Nauticus; an inexpensive paddlewheel ferry runs between the Portsmouth and Norfolk waterfronts. Downtown Norfolk even has a cruise ship terminal, and while we were at Tidewater we saw several gigantic cruise ships stop to visit. The biggest problem in Portsmouth was getting around on the highways. There are so many rivers and creeks that roadways are constrained as to where they can go. There are only a couple of Elizabeth River crossings in the vicinity (both are tunnels), and many lanes of regional traffic funnel into the two tunnel lanes (in each direction) causing perpetual traffic jams. We had to drive to a few Caribbean 1500 meetings in Hampton, and it was also tough crossing the waterways to/from Hampton, since all the traffic funnels into two more tunnels. As a tip, I think the I-664 tunnel has less traffic than the I-64 tunnel. I actually made three driving trips from Annapolis to Portsmouth, twice to visit and work on the boat, and the final time to leave for the Caribbean. The trip was 236 miles each way, and the slowest part was always getting through the tunnels. While working on the boat, we wound up driving around the Portsmouth area a lot, visiting stores for tools, supplies, and provisions. There are plenty of shopping areas on Portsmouth's side of the river, although the West Marine was on the Norfolk side which required a trip through the congested tunnel. Driving around downtown Portsmouth and the surrounding area, I noticed a number of pawn shops, check cashing, and payroll advance businesses, which pretty much guarantees that there are lots of poor people living from hand to mouth who are being ripped off by the various money handling businesses. It's always disappointing to see those types of opportunistic businesses spring up to take advantage of poor people. Over the next several pages, I have more pictures of Portsmouth and Tidewater Marina. 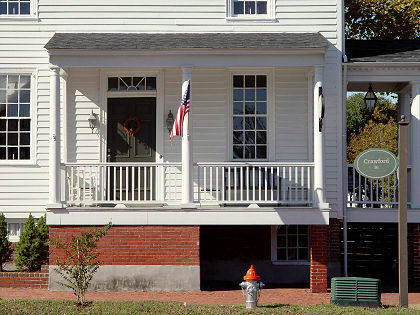 Two views of the Patriot Inn Bed & Breakfast, at the corner of Crawford Street and North Street in Portsmouth, a couple blocks south of the marina. Click on the right-hand picture to see a bigger version; use your browser's "back" command to return here. 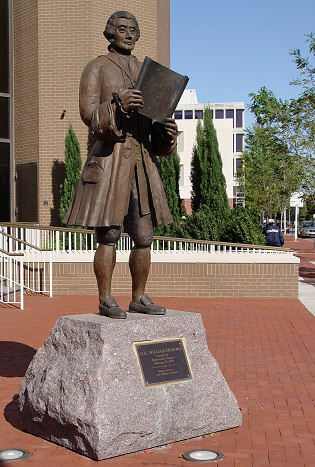 A statue of Colonel William Crawford, who founded Portsmouth, Virginia, on February 27, 1752. The statue is on the northwest corner of High Street and Crawford Street in the heart of downtown Portsmouth. 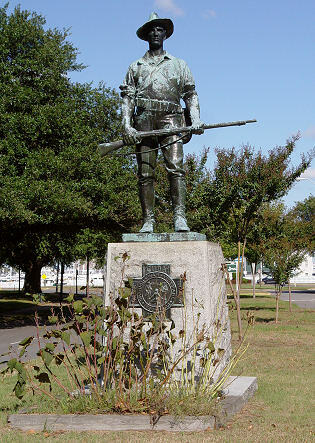 A statue honoring Spanish-American War Veterans, located in the median strip of Crawford Parkway just north of North Street.